The James C. Self Conference Center on Piedmont Technical College's Greenwood Campus offers 13,746 square-feet of meeting rooms, classrooms, auditoriums, kitchens (complete with refrigerator/stovetop/oven/counter space/ice maker), casual seating, an outdoor patio area, and convenient parking. We do not restrict catering and can set up catering services for you upon request. The building also offers many high-tech amenities including wireless internet access and international teleconferencing capabilities. Whether you are hosting a large event or a small meeting, our dedicated staff members are there to offer support and ensure your event is a success. 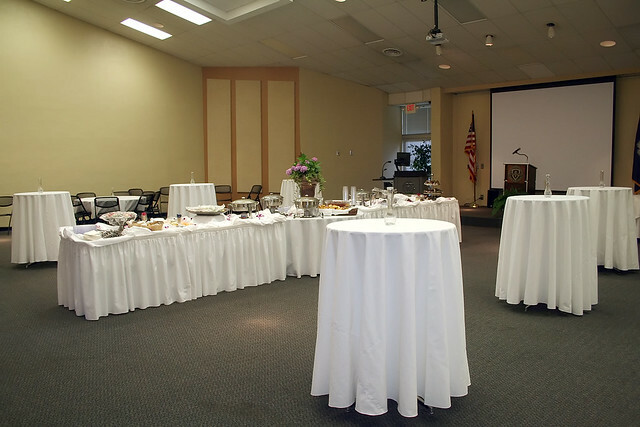 The facility rental fee includes the use of basic 8ft or 6ft rectangle tables and chairs. Other table sizes are available for an additional charge. For upgrade information, or to reserve space, download our reservation form.